What Do I Plant in a Flower Box? This is a very good question, and although the obvious answer is "flowers," it's always a great idea to consider what types of flowers are most suitable for your situation and desires. The first advice we have is to consider location. Are you in an apartment and considering planting on the balcony? In that case, consider how much light your side of the building receives during the day. 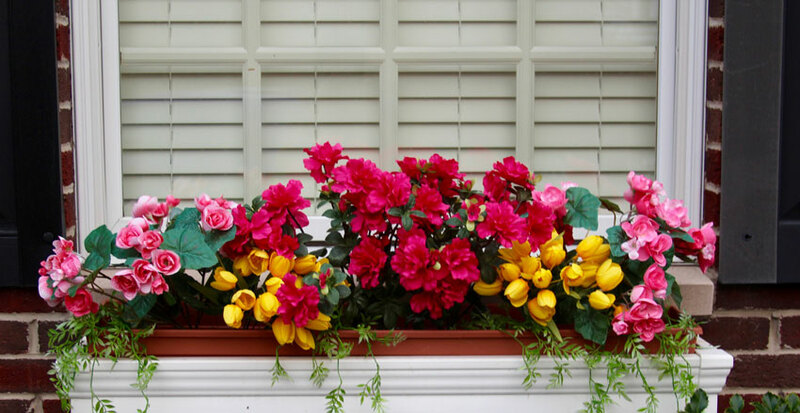 Choose the type of flowers according to how much sun they need to ensure maximum growth and long life. In a low-light environment, shade plants like ferns might make good choices, whereas most flowers are better suited to a sunny spot. These tips apply to all gardening, as well, not just in apartments. If you're working in a backyard garden and wondering, what do I plant in a flower box,then these same answers still apply. If a large tree or other object creates heavy shade, this should influence your decision accordingly. In the next paragraph we address such concerns as time of year and how to keep your plants growing healthy and beautiful. If at any time you have any questions not addressed in this article, feel free to contact us – we'd be happy to assist you! Here are some additional suggestions we think will help keep your gardens green. Soil should be one of your prime considerations when preparing a boxed garden, or indeed a garden of any variety. You need quality, nutrient-rich soil to ensure that your plants will grow as quickly as possible, and to ensure that they won't end up dead, and you wondering what you did wrong. If your soil is poor, consider purchasing some manure – sheep is a great choice – and mixing that into the dirt. Peat moss also makes a worthy addition, and helps to bring out the color in your garden. Another easy answer is to remember to water your garden! Find out how much water everything needs and then don't forget to head out there with a watering can now and then, especially in the summer when it's dry and hot. Less water will be needed in the spring and fall when it tends to rain more often, so keep that in mind as well. We hope these suggestions have helped to answer your questions about what do I plant in a flower box, but if there's anything that we left out or that you aren't clear about, please feel free to contact us! We love to hear your feedback and would be more than happy to help you with your gardening questions.